Zo”es Kitchen (NYSE:ZOES) , a fast-casual restaurant concept offering fresh, made-from-scratch Mediterranean dishes, continues its expansion and announces its first location in the state of Missouri, opening today at 100 Ward Parkway in Kansas City, MO. This newest location will bring the company’s total number of restaurants to 142 locations across 16 states. Zo”es Kitchen menu items are comprised of fresh produce and lean proteins that are predominantly preservative and additive free. Signature dishes include salads, chicken kabobs, chicken rollups and hummus. Zo”es Kitchen also offers a variety of gluten-free, vegetarian and vegan options. Every dish is made from scratch daily from original recipes – perfect for guests who value eating real, unprocessed foods but whose busy lives limit their time in the kitchen. Zo”es’ Kansas City location seats approximately 72 guests in the dining room, including an outdoor patio which seats 40. The restaurant is open from 11 a.m. to 9 p.m. daily. 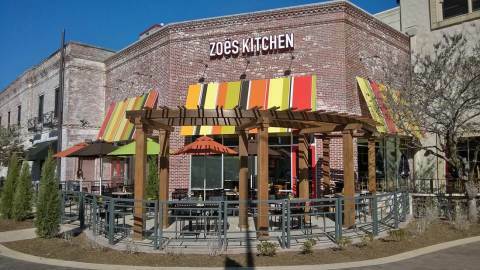 Founded in 1995, Zo”es Kitchen (NYSE:ZOES) is a fast casual restaurant concept serving a distinct menu of fresh, wholesome, Mediterranean-inspired dishes delivered with Southern hospitality. With 142 locations in 16 states across the United States, Zo”es Kitchen aims to deliver goodness to its guests by providing simple, tasty and fresh Mediterranean meals, inspired by family recipes, and made from scratch daily. For more information, please visit www.zoeskitchen.com, www.facebook.com/ZoesKitchen or twitter.com/ZoesKitchen.